Until world war ii, one of britains premiere touring sports car was called the aston martin. The war didnt alter its quality, but postwar models sported an addition new initials. The david brown tractor and gear organization purchased the company and added db to the aston martin name. 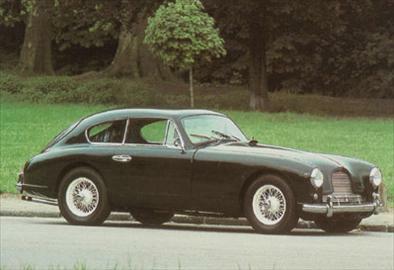 Make room the primary difference between the fast-touring db 24 and its predecessor, the db 2, was the adjustment made to the frame and chassis to accommodate rear occasional seats. Altering as little as possible the outwardly elegant touches of the db 2, aston martin repositioned some of the interior components including moving the pedals forward two inches, telescoping the steering column to compensate for the changed pedal position, and making the seatbacks thinner and narrower to allow for more space in the back. An x-bracing in the frame was removed to deepen the rear compartment. purrfect aston martin was known as much for its exhaust noise as for its looks. The db 24s 2.58-liter, double-overhead-cam, six-cylinder engine growled pleasantly at its top speed of over 111 mph, and flush side windows reduced wind noise. It was a sound drivers loved to listen to. Many consider the db 24 to be the first hatchbac.